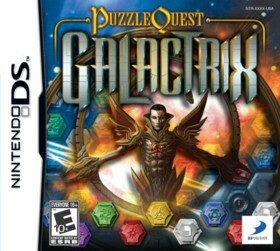 Puzzle Quest: Galactrix is a Nintendo DS game in the Puzzle genre. The game was published by D3 Publisher and developed by Infinite Interactive. The game has an ESRB Rating of E10+ (Everyone 10+) and was released on 2009-02-24. The game's official site can be found at www.infinite-interactive.com/galactrix.php. This is a really good sequel to Puzzle Quest and this time the developers have taken the theme to space. This game is very fun and involves going from planet to planet solving “bejeweled” like puzzle battles with various enemies along your path. The puzzles are quite interesting and challenging. The great part about this game though is that even with failure you will still gain experience and will eventually go up levels and become stronger :) This is the unique element of the puzzle quest games as they combine puzzle and RPG elements into one game. I really enjoyed going up levels and exploring the various worlds. The story, graphics and sound are all very good as well and the music is superb and really creates a great tone. Overall this game is a great puzzle/RPG game that I recommend to any gamer who wants to try something new and challenging in the puzzle genre.